Annoying when there are suddenly aphids on decorative water lilies. What are causes, symptoms and how to control the pests? In addition to water lily leaf beetles and lily sprayers, aphids are common pests of the aquatic plant. The flowering pond plants mainly affect the lily paddling louse (Rhopalosiphum nymphaea). How does aphid infestation develop? Aphid infestations occur mainly on plants that are near the shore or partially on the riparian zone. 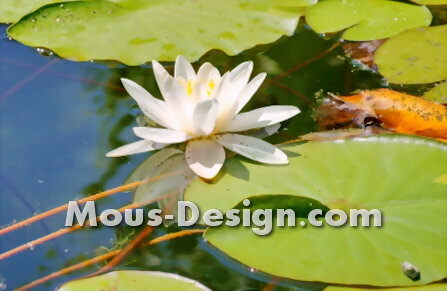 From there, the pest reaches the stems and leaves of the water lily. In particularly warm summers an infestation is increasingly observed. If cherries, plums and sloes are found near the pond, the lice are not far away. The reason: The pests hibernate on these trees and infest pond plants in the warm months. Aphids - what is an infestation? Lily aphids infest and damage all parts of the water lily that are above the water surface. Visible are so-called suction damage, which is manifested by bright spots and crinkles. Also striking is the pest itself: the adult lice are one to two millimeters in size and dark in color. The pests occur in winged and unglügelter form. The larvae are similar to the adult animals, but have a lighter color. The lily pad lice not only harm the plant directly; In addition, they excrete honeydew, which promotes the colonization of blackening fungi. In the worst case, aphid infestation leads to the death of the entire plant. How to combat lice on water lilies? First of all, it makes sense to grip the water hose. With a medium hard jet, the pond owner can easily flush down pests. If this measure does not bring the desired success, it helps to clean the leaves by hand. Use a damp sponge, a cloth or a cotton ball. These methods should be carried out daily for one week. In case of persistent infestation, the use of chemical agents is taboo. Because these add considerable damage to the pond inhabitants and the insect fauna. The use of biological agents is a good alternative to the chemical mace: apply horsetail once a week until the lice have disappeared. Regular monitoring of pond plants helps to quickly detect and combat new pest infestations. By the way, locating the predators Fish and Ladybugs is the ultimate method of keeping the pests in check, of course. Water lily aphid - a cause for concern? Those who recognize the aphid early need not worry about its pond plants. Benefits and biological remedies help in combating. Creating a garden pond: what does it cost? These and many other questions we answer in our price radar around the theme of garden pond.